David Gaider recently left homebase Bioware after nearly two decades of writing for them, including being the lead on the Dragon Age universe across all three games. 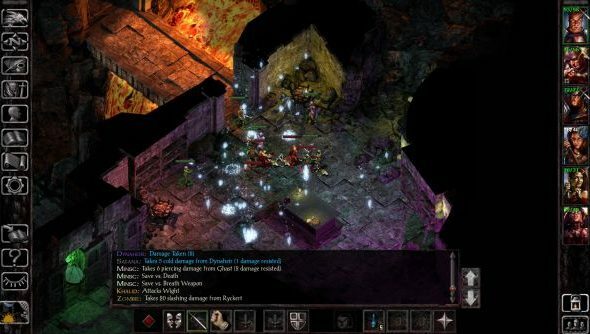 Naturally, fans were interested where he would end up, and it turns out he hasn’t gone that far – Beamdog, set up by ex-Bioware founders to work on and distribute the enhanced editions of the Baldur’s Gate games, was his destination. Gaider’s at least partly responsible for some of the best RPGs of all time. The move was announced via a short blogpostfrom Beamdog, andon Twitterby Gaider himself. His official title is Creative Director, moving him up a couple of rungs in the annals of videogame corporate structure. The position he actually applied for was senior writer, but they “upgraded the role” once Gaider was interested, knowing he could handle that level of responsibility. It’s a natural fit for the man, as he also worked on Baldur’s Gate 2 and its expansion, Throne of Bhaal, nearer the start of his career. Beamdog are currently working on an expansion to the first game’s Enhanced Edition called Siege of Dragonspear. It aims to bridge the gap between it and the sequel. Presumably, having someone who worked on the series on board is a massive boon. There’s no mention of other new products from Beamdog, but they also don’t specifically say Gaider’s only working on Siege of Dragonspear. He’s there to “direct new creative endeavors for the company” which I will leave you to speculate about. Nobody’s happy doing remakes forever, are they? If you want to know more about Siege of Dragonspear, Jeremy spoke to Beamdog about it last year.